I was raised by a teacher and then I married one. We must support our teachers better – and it starts with eliminating the over testing of our children and getting more funding directly to the classroom. No teacher should be forced to spend hundreds of dollars from his or her pocket to fund their classroom. (Little Elm, TX) Today, the Jared Patterson for State Representative campaign announced unanimous support and endorsement from every member of the Little Elm ISD Board of Trustees. The announcement comes on the heels of a string of endorsements from prominent local officials. Patterson is running for the Texas House in District 106, a seat being vacated by Rep. Pat Fallon. The local ISD officials endorsing Patterson are Board President Melissa Myers, Board Vice President David Montemayor, Board Secretary Jason Olson and Trustees Alex Flores, DeLeon English, Dan Blackwood and Leanna Harding. Also announcing his endorsement for Jared Patterson is Frisco ISD Trustee Steven Noskin. Patterson strongly supports Texas teachers and students. His mother taught public school in Whitesboro, Texas for 38 years and his father served three terms on the local school board. His brother serves there now. Leslie Patterson, Jared’s wife, taught public school for six years before deciding to stay at home with their three children. Combined, Jared and Leslie Patterson have more than 90 years of public school teacher experience in their immediate family. As your State Representative, I will boldly stand for our conservative values. With your support, we can keep conservative representation in House District 106.
ps. Please consider making a $25, $50 or $250 donation today. Your help is crucial in this battle. On Tuesday, Jared Patterson announced that he had received the endorsement of 27 in-district city officials including 7 mayors. The outpouring of support continues the momentum his campaign has experienced over the last several months as it’s received countless Republican and local officials’ support. Lakewood Village Mayor Pro Tem Eddie A Reed, Jr.
(Frisco, TX) The Jared Patterson for State Representative Campaign announced another round of endorsements on Thursday, this time from the Mayors of seven area cities. The seven area cities, in combined population, represent approximately 110,000 North Texans. “With Jared Patterson representing us, I know we’re going to get good legislation and a reliable conservative vote to protect our communities, businesses and families,” said Mayor Joe McCourry of The Colony. “Jared is an effective and smart leader. He’s going to be a huge asset in the legislature.” Little Elm Mayor David Hillock said. These recent endorsements add to a growing number of supporters released over the past few weeks, including Denton County law enforcement officials, a super-majority of in-district GOP Precinct Chairs and statewide conservative groups. A local small businessman and engaged community builder, Jared and his wife Leslie have three children and are members of the First Baptist Church of Frisco, Texas. Jared Patterson is running for the Republican nomination in Texas House District 106, which covers east and northeast Denton County. The Republican Primary is on March 6, 2018. Early voting begins February 20, 2018. Yesterday, Representative Patrick Fallon traveled to Austin to make his Texas Senate candidacy official. Today, I met with the Denton County Republican Party leadership and officially filed to run for State Representative in House District 106! Since entering this race in August, I’ve had the great fortune of meeting wonderful conservatives throughout the district. In sharing my conservative vision, and clearly stating where I stand on the important issues facing Texans, we’ve been gaining momentum – and conservatives from across Texas are noticing. You’ll recall recent endorsements from the Denton County Sheriff Tracy Murphree, Denton County Constables Michael Truitt and Doug Boydston, and a super-majority of Republican Precinct Chairs. Now, we’re proud to announce endorsements from impactful Texas conservative groups such as Texas Right to Life and Texans for Fiscal Responsibility! Voters, elected leaders and conservative groups are letting it be known – Jared Patterson is the conservative candidate who will fight for life, for the Second Amendment, for tax and spending reforms, for transparency at TXDOT and against subsidies for illegal immigrants. There are 111 days until Election Day, and I need your help! If you share my conservative values, please take a moment to visit my website, sign up to volunteer and consider making a financial contribution of $111! Together, we can ensure Representative Fallon leaves HD 106 in good hands. Thank you for your trust and the faith you’ve shown in me. 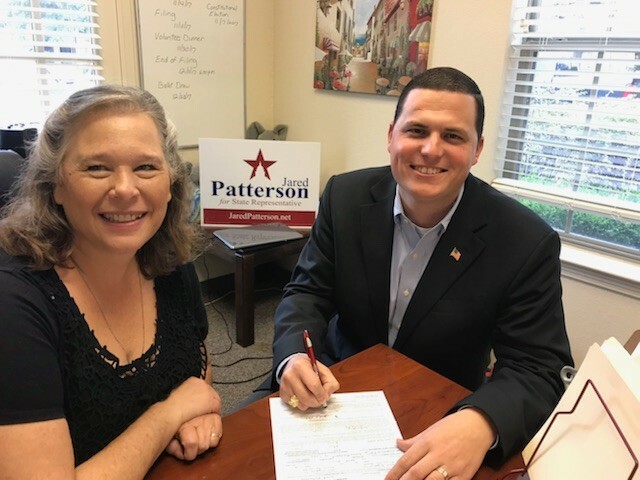 (Frisco, TX) Wednesday, the Jared Patterson for State Representative Campaign announced support from a super-majority of Republican Precinct Chairs in House District 106. A Precinct Chair is the local representative of the Republican Party at the grassroots level in each voting precinct. The announcement comes nearly a month after the public endorsements of Denton County Sheriff Tracy Murphree and Denton County Constables Michael Truitt and Doug Boydston. Patterson has been a lifelong conservative activist and is a former precinct chairman, former city councilman and has served as a delegate to the Republican State Convention three times. He and his wife, Leslie, have three children and reside in Frisco, Texas. Jared Patterson is running for the Republican nomination in Texas House District 106, which covers part or all of the cities of The Colony, Frisco, Little Elm, Oak Point, Cross Roads, Krugerville, Aubrey, Pilot Point, Celina, Prosper, Providence Village, Hackberry and Sanger in east/northeast Denton County. The Republican Primary is on March 6, 2018 and the general election is on November 6, 2018. There are 150 members of the Texas State House, elected to two-year terms. and meet & greets. Join us! at Shan & Dr. Brad Dean’s home. For years, conservatives in the Texas House have been silenced by Speaker Joe Straus and his lieutenants. However, it’s a new day! I am pleased to report to you that Speaker Straus and Chairman Cook announced today that they will not be seeking re-election this cycle! Texans will finally have a new Speaker! This next legislative session will be the most important session in more than a decade – as we force the conservative agenda to forefront. I pledge to you today that I will fight to elect the most conservative Speaker possible so that we can finally end abortion, institute constitutional carry, reform the broken property tax system and end taxpayer subsidies to illegal immigrants. Please help me get to the House by contributing $50, $100 or even $250 TODAY! Let’s not waste this opportunity to exercise the strength of the grassroots conservatives in Texas! 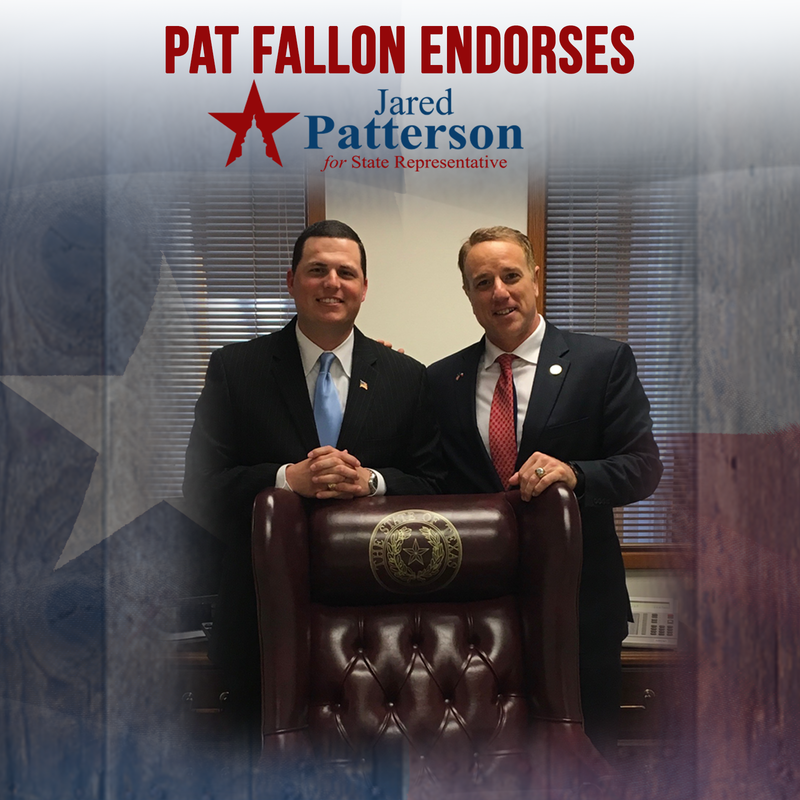 (Denton, TX) Today, law enforcement leaders in Denton County including Denton County Sheriff Tracy Murphree, announced their endorsement and support of Jared Patterson, who is running for the seat being vacated by Pat Fallon in the Texas House of Representatives. “We need to make sure Pat Fallon is replaced with a committed conservative who is ready to stand for the people of Denton County, not the special interests in Austin. This is why I support Jared Patterson for State Representative,” said Sheriff Murphree. The announcement from Sheriff Tracy Murphree matched similar endorsements for Patterson from two Denton County Constables, Doug Boydston and Mike Truitt. Patterson has been a lifelong conservative activist and is a former precinct chairman, former city board member, former city councilman and has served as a delegate to the Republican State Convention three times. He and his wife, Leslie, have three children and reside in Frisco, Texas. Jared Patterson is running for the Republican nomination in Texas House District 106, which covers part or all of the cities of The Colony, Frisco, Little Elm, Prosper, Oak Point, Cross Roads, Krugerville, Aubrey, Pilot Point and Sanger in east/northeast Denton County. The Republican Primary is on March 6, 2018 and the general election is on November 6, 2018. There are 150 members of the Texas State House, elected to two-year terms.